2.Open App And Register with your mobile number. 3.Go To Menu >> Scratch & Win,Scratch and click on claim now.You will get credits depend on your luck. 4.On start screen there are many apps available,install all apps through FreeBuster and get instant credits. 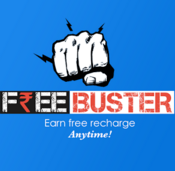 5.Go To Menu >> Share & Earn,Share your unique referral link from there.You will get Rs 10 instantly when your friend install FreeBuster and complete at least one offer by installing app. 6.Earn Minimum Rs 10 for recharge.Go To Menu >> Withdraw,Enter your recharge details you will get recharge instantly.